﻿The ascent to the Col de la Croix de Fer from the south-west is a considerable job. It is long (32 kilometers), and top and foot differ by over 1350 meters of altitude. To this range another 210 meters should be added, which one descends on the way and which hence have to be climbed again. The first eight kilometers are easy. Climbing the dam of the Lac du Verney is nothing compared to what awaits the cyclist further on. When the road bends to the left side of the valley, the party really starts. The road heads almost due north and climbs 480 meters within five and a half kilometers. The steepest 500-meter-intervals have a slope of 10%. In the village of Le River d'Allemond some recuperation is possible. After a steep descent (106 elevation meters) the hardest part of the ride, through a narrow valley (Défilé de Maupas), begins. This section counts five kilometers, of which the steepest has a gradient of more than 12%. Just after the descent a section of 250 meters even has a slope of 14%. It is only getting easier (6%) where the road winds upwards to a dam through two hairpin bends. The remainder of the ride takes place in a barren mountain landscape with high peaks in the background and still counts nine kilometers. Though the slope is not that steep any more, for me the length of the ride started to be a factor here. 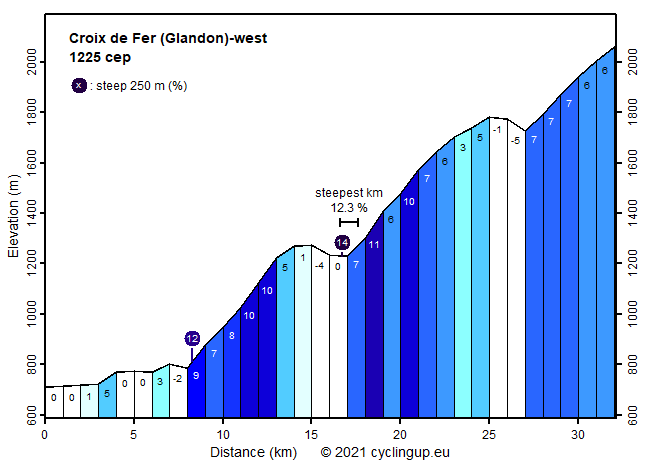 There is a descent of 75 meters and the steepest part (8%) lies just before the junction to the Col du Glandon. From there, two and a half kilometers remain to the Croix de Fer. The Col du Glandon is a stone's throw from the bifurcation. It is easier (1140 climb effort points i.e. cep and 1422 elevation meters) than the Col de la Croix de Fer (1225 cep and 1565 meters).